My son just began crawling 2 weeks ago. We have noticed that he uses his right leg for “pushing off” and then brings his left leg up afterwards. He never leads with his left leg. When he pulls himself up to stand, he uses both legs equally. He likes to hold our fingers and practice walking and he is able to step forward with both legs. Should we be concerned about the lopsided crawling? Or is this a normal process and just how he learned to move himself around? 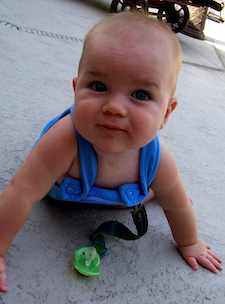 Your son’s lopsided crawling is likely normal, but should be evaluated by your doctor. While not common, I probably see a child with a crawl that favors one leg every year. Fortunately, in my practice these children simply learned a lopsided crawl and did not have a physical problem. Are there any other signs of leg or developmental problems? Does he sit symmetrically? Do his legs appear even in size and muscular tone? Was he breech at birth? I'm encouraged that he his using both legs evenly when pulling up and walking with assistance. Many children skip crawling and go straight to walking. I would not worry once he has moved past crawling and is walking well. Hopefully, your son’s crawling has improved since you submitted this question. If his crawl is still lopsided ask his doctor to evaluate him. Bring a video to show your doctor his style of crawling.